When it gets hot outside, we don’t put our crochet needles down. We pick warm weather patterns up. 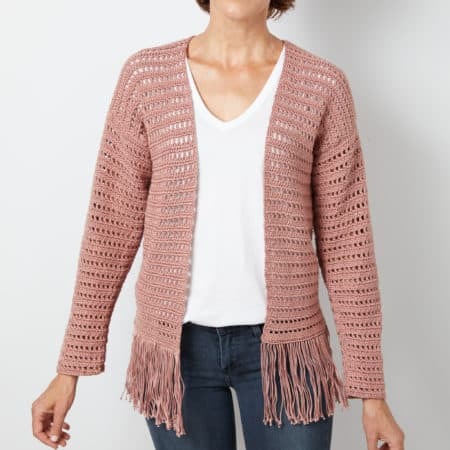 This is the kind of fringe cardigan crochet pattern you’re looking for. It’s light and cool, not to mention ultra stylish. 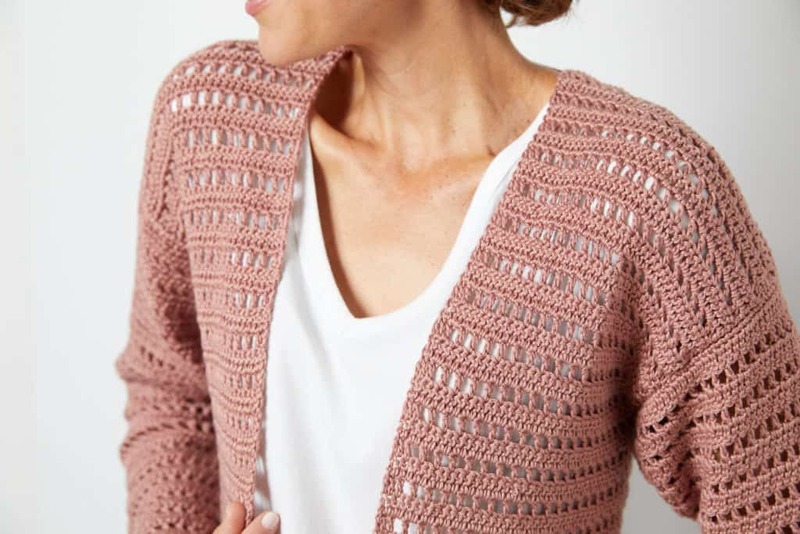 This cardigan is made with Cascade Ultra Pima DK yarn in Vintage Rose. 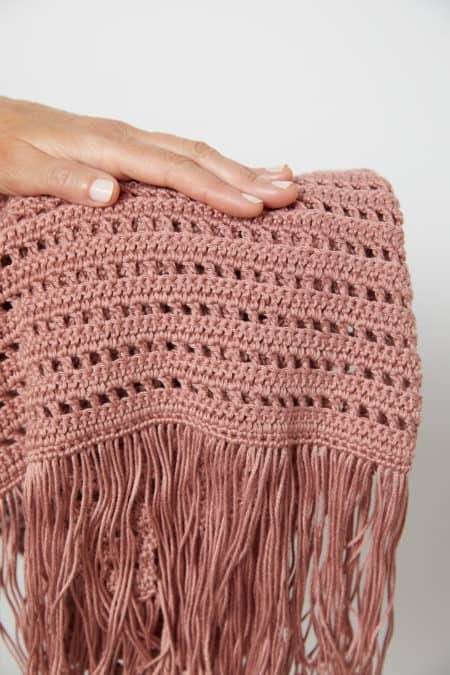 This is absolutely the perfect yarn to use for this project because it’s lightweight and durable which carries well through the summer, but also has a beautiful drape to it that will work into the fall and winter. The Vintage Rose color used for this project is versatile and can be paired well with black, brown or even pops of color. And good news! I’ve partnered with local yarn stores to put together a kit for this pattern. 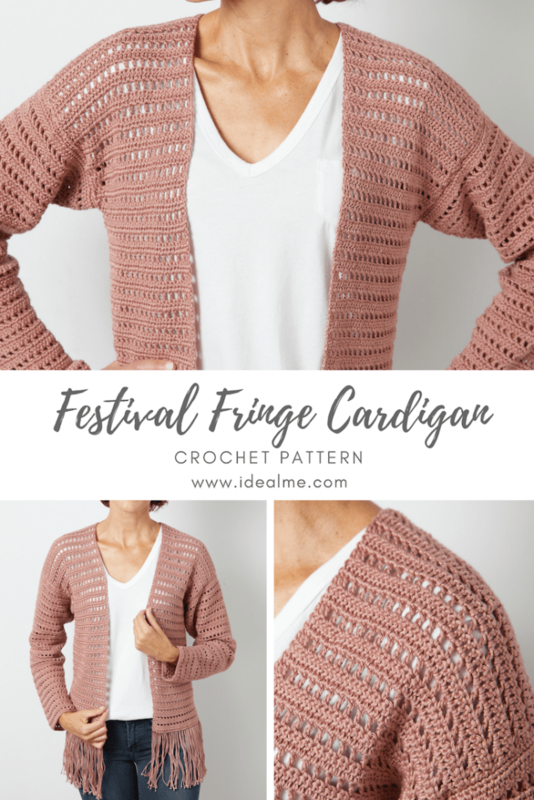 Every kit includes the digital PDF pattern for the Fringe Cardigan, plus all of the yarn you need to bring this project to life. For the next 24 hours, you can purchase your kit here and save 10% off your order. Plus you can feel good about your purchase because you’re supporting a small business who is passionate about crochet. I love supporting other makers, and it’s great to be a part of such a supportive community. 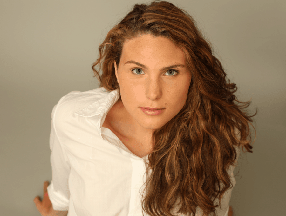 Pattern is written for size small with changes for medium, large, and X-large in parentheses. Row 2: Ch 2 (counts as first dc here and throughout), dc into each st across, turn. Row 3: Ch 2, dc into the 2nd st, *ch 1, sk 1 st, dc in next st; repeat from * across, turn. Rows 4-54 (4-54, 4-56, 4-56): Repeat rows 2 & 3. Last row: Ch 1, sc across. Fasten off. Row 3: Ch 2, *ch 1, sk 1 st, dc in next st; repeat from * across to last st, dc in last st, turn. Row 4: Ch 2, dc into each st across, turn. Row 8: Rep row 4. Row 43: Ch 1, sc across. Fasten off. Facing the right sides together, line up the corners of the front and back panels. Whip stitch the top of the shoulders together and weave in ends. Place the right side of the sleeve against the body. Whip stitch sleeve in place, making sure not to pull too tightly. Repeat for other sleeve. Sew sleeve and lower side seams. Weave in all ends. Cut approximately 200 12” lengths of yarn for fringe. 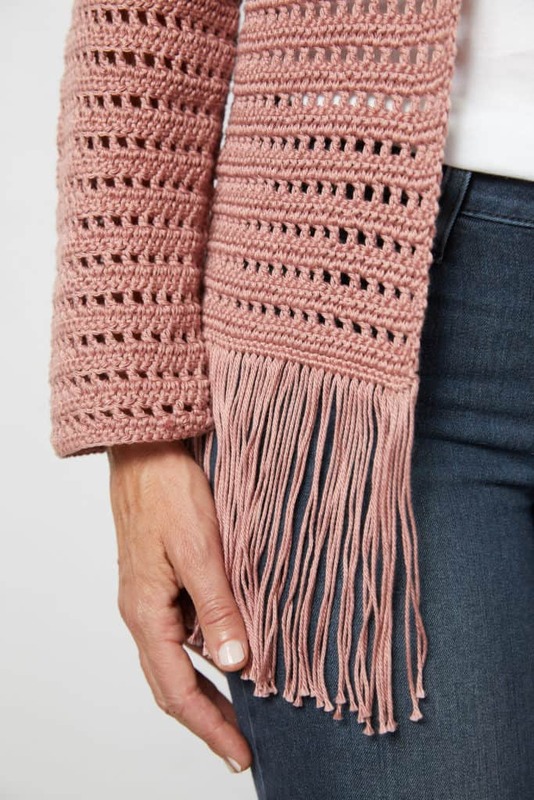 Fold fringe string in half, and pull the loop though the first stitch on the bottom of the cardigan with a hook, then pull tails through loop and pull snug. Repeat around. 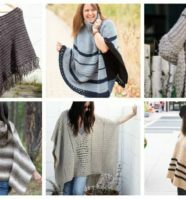 To increase the size of this cardigan, add in multiples of 10 ch to the sleeve and front pieces, and increments of 20 to the back. 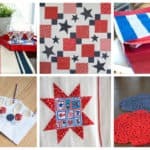 For medium, add 2 rows in length to all pieces. For large, add 4, and extra large add 6. For a custom fit, ch to your perfect length, just be sure it’s in multiples of 2 plus 1. We think the Fringe Cardigan is an easy pattern that looks really impressive and the fringe on the bottom adds a modern detail that really sets it apart. 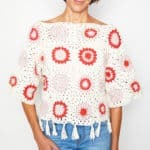 If you’re ready to get started making this gorgeous crochet wearable, go to our Maker Drop shop to purchase the full kit here. We are on Instagram! 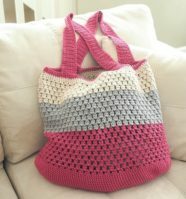 Follow us for our latest crochet patterns! Hello. I was wondering, is there a multiple chain for this to make it larger? I’m not sure what size your pattern is for but your model looks like a small. I’d like to try this in a large size if you are able to provide the chain length for that I would really appreciate it. 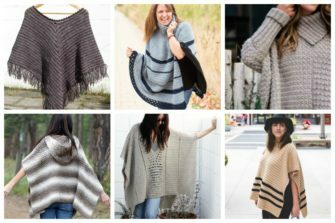 The cardigan pattern doesn’t give any size information. As a more generously proportioned individual, with lymphedema in both my arms, sizing and measurements make a huge difference in whether or not I am interested in working a pattern. While I like this pattern in general, I wouldn’t consider buyin or working it without that information. What size is it? I purchased this pattern earlier in the month but couldn’t see anywhere where it specifies size or how to adjust for a different size. Any suggestions? Sorry for the late reply. I’ve now updated the post to show how to modify in different sizes. Hi just wondering if this is set in different sizes. It only mentions whatever size in the picture but I did not see a size listed. It is beautiful and worth trying if it comes in different and bigger sizes. Love the cardigan! What size would that be? 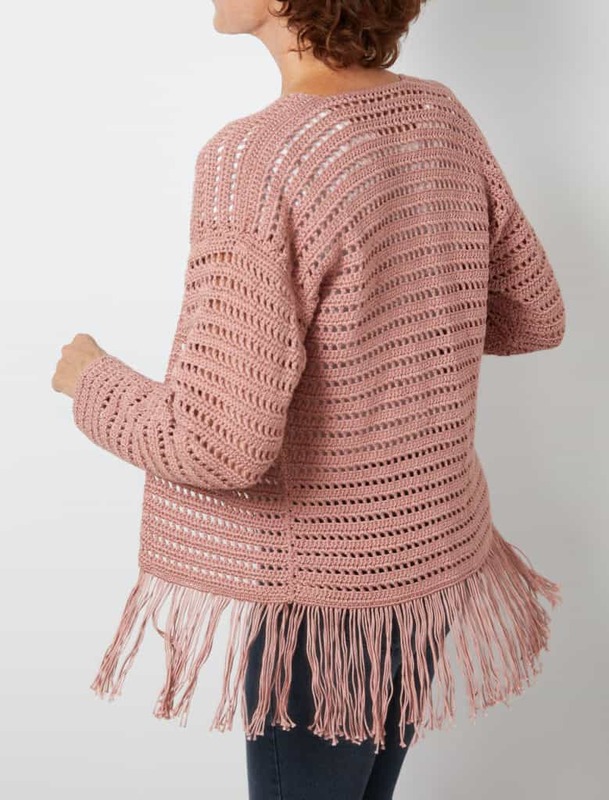 Hi, I am curious to know the size of the cardigan and can it be enlarged or downsized? I saw no reference to the size. It is very beautiful and I love it. Sorry, for the late response. We’ve since updated the post for the correct number or chains as well as sizing.